We are a local, woman-owned graphics, printing and marketing company operating in Hillsboro, serving the city of Portland Oregon and surrounding areas. 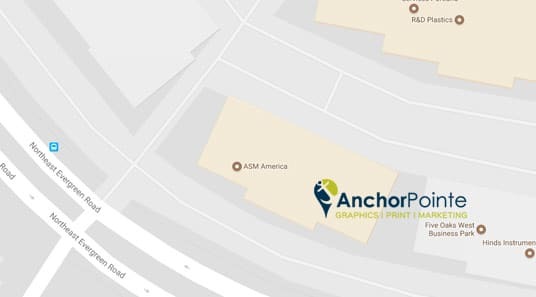 In 2017 we celebrated our 17th year in business by branching out from the national franchise we’d been a part of to become an independent company under our new name, AnchorPointe Graphics. This decision was inspired by the realization that the way we think as a business is as unique as the city and state we live in. We use our experiences to build on our knowledge of the print and marketing world, so we can advise you on best practices, cost savings, and creative ideas and products. We know our strengths, thrive with our your successes, and pride ourselves on our unrivaled customer service and communication skills, and consistently meeting or beating project deadlines (98.8% of the time, in fact). We’ve outfitted our clean, well-organized brick and mortar facility with proven and state of the art printing and production equipment. With the latest design software, high-speed digital printers, high-resolution large format machines, automated mail prep systems, offset press, and full production, bindery, and finishing necessities, we’ve got an impressive scope of capabilities, and our carefully curated team has got the skills and experience to back it all up.